Facebook's CEO Mark Zuckerberg discussed the incident in a post. Zuckerberg noted that he was "deeply disappointed" by the news. It's uncertain if the company will attempt another satellite launch soon. Zuckerberg explained that the company's Internet.org plans will not come to a halt. He stated that Facebook has already developed other technologies, like a fleet of solar-powered aircraft called Aquila, to bring the Internet.org initiative to more regions. The solar powered Aquila drones, which at cruising speed, use the same wattage as three hairdryers or a powerful microwave; 5,000 watts. Once they are fully operational, these high-altitude planes will stay airborne for up to 90 days at a time. They will also be broadcasting Internet coverage to a 60-mile-wide area on the ground, helping to open the opportunities of the Internet to people in under connected regions. Aquila is not the first plane outfitted with solar panels, organizations such as NASA, and Swiss project Solar Impulse, have done so as well. Just recently Solar Impulse 2, piloted by André Borschberg and Bertrand Piccard, reached Abu Dhabi on July 26th 2016 after leaving Abu Dhabi more than 16 months earlier (several stops were made along the way). This trip completed the approximately 42,000 kilometer (26,000 mile) first circumnavigation of the Earth by a piloted fixed-wing aircraft using only solar power. Video of the Aquila solar powered drones in action. 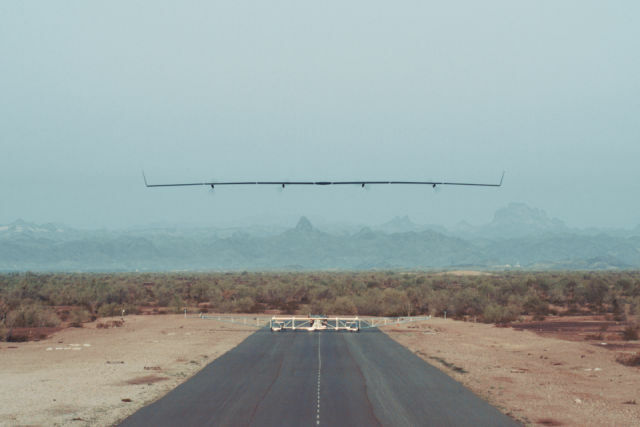 Facebook's Aquila solar powered drone takes off from its launch dolly.